THIS EVENT TAKES PLACE ONLINE. 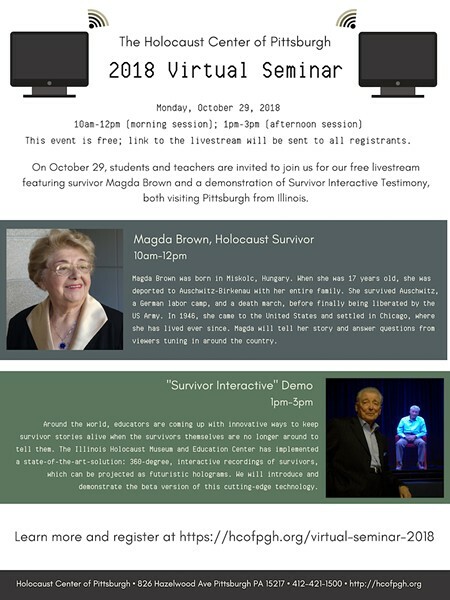 On October 29, students and teachers are invited to join us for our free livestream featuring Holocaust survivor Magda Brown and a demonstration of Interactive Testimony AKA “The Hologram”, both visiting Pittsburgh from Illinois. Magda will speak from 10am-12pm, and we will conduct a demonstration of the hologram from 1pm-3pm. Classes and individuals will need to register to receive the link to the livestream.